The MSF medical teams in Port-au-Prince have been treating very large numbers of people who come to them with fractures, head injuries and other major trauma from the quake. Well over a thousand patients been through the four tented facilities that MSF has set up near the damaged buildings that it used to work in. The main concern at the moment from the medical staff in those clinics is that the need for wound treatment and major surgery is overwhelming. One of the teams is moving into the major public hospital in the district of Cite Soleil, where MSF has previous experience of working. There is an operating theatre in that hospital, which will help to cope with some of those cases. 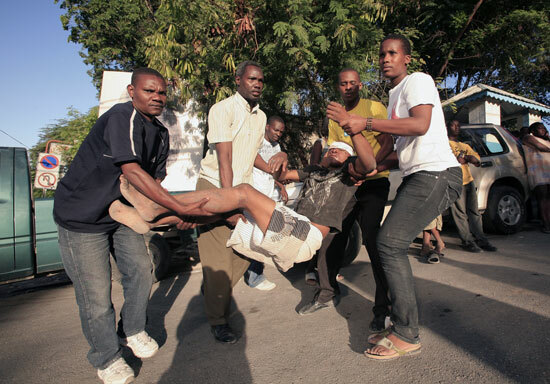 Residents help an injured man after the earthquake in Port-au-Prince. January 2010. Food, water and shelter materials are all in short supply, although medical stocks are not yet exhausted and more are on the way. "Basic provisions were always problematic for people in Port-au-Prince but the position is far worse now," says Vincent Hoedt, one of MSF's emergency coordinators. "And obviously there's a concern for people who are already weakened by injuries. There are also shortages of things like gasoline, which affects the working of all kinds of vital equipment." The struggle is also to get in more MSF medical staff and kit - there are seven charter flights lined up but only one of them so far has been able to get to Port-au-Prince. That came via MSF's logistical centre in Panama with 25 tons of relief material, including 3 medical disaster kits and blankets, plastic sheetings, hygiene and cooking sets, tents and jerrycans. Up to 80 additional MSF staff are expected to reinforce the efforts on the ground, once they can get into Haiti. We are still concerned about our staff in Port au Prince. The teams have not been able to confirm the whereabouts of all their Haitian staff because it's still very difficult to locate people in the city or to get working communications. That worry extends to some of the patients who were in MSF's buildings when they were damaged by the earthquake.